Meet Stacey O’Byrne, just one of our amazing speakers at the upcoming LifeWave Live! Copenhagen event on the 27th – 29th April 2018. 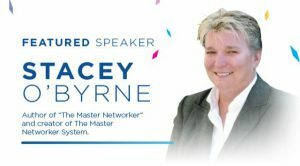 Author of “The Master Networker” and creator of The Master Networker System, Stacey is joining us at our annual events to give you the tips you need to help invest in you and your business. Thank you to Stacey for agreeing to attend our upcoming events. Whether you attend California or Copenhagen this year, you are sure to take away some valuable tips and tricks from Stacey’s presentations. REGISTER NOW for our LifeWave Live! Copenhagen Event on the 27th – 29th April 2018.